UNDER CONSTRUCTION: The Common Greenspace! The Common greenspace is under construction, expected to open summer 2019. The Groundbreaking for The Common Park, was held on Tuesday, October 17th at 1:45 PM in the Central ARTSTATION Engine Room (due to the rain) kicking off the official ‘start’ of the construction! City officials, neighbors, and lovers of downtown all gathered together to celebrate the 2.4 acre greenspace that will be a cornerstone of redevelopment for the 9-block area. The construction company Boggs and Poole plan to start work as soon as possible. The park is scheduled to be completed in 6 months, in time for the summer of 2019! However, the completion date is dependent on the weather. Private donations are still being sought for several art amenities within the park. Naming rights for several locations are still available! The Common park is coming! Construction begins Summer 2018! 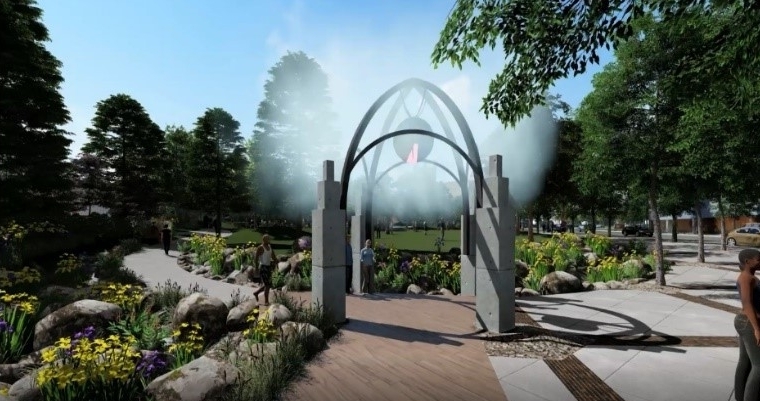 Shreveport Mayor Ollie Tyler announced Monday, May 21, that, pending city council approval, $1.2 million in funds from the Economic Development Administration would be appropriated to go toward constructing the 2.4-acre greenspace, The Common park! Construction will likely begin at the end of the summer of 2018, and 2 years of community planning formed the design of The Common community space. For more information, to make a donation, or to tour Shreveport Common call Wendy Benscoter, Shreveport Common Executive Director- (318) 673-6537, or Haley Deshautelle, Shreveport Common Neighborhood Liaison- (318) 673-6543. Or feel free to email us at wendy@shreveportcommon.com and haley@shreveportcommon.com. Also, see new releases from The Shreveport Times and Heliopolis. Looking for a place to sit in the shade and enjoy an outdoor lunch? Join us on Give for Good Day, Tuesday, May 1st from 11 am - 1 pm in Shreveport Common for Picnic in the Park! We'll be bringing out tables and chairs and you can sit and enjoy the shade trees and light music. TAQUERIA LA MICHOACANA will be on site dishing up burritos & tacos along with SHIVER SHACK SHAVED ICE with snow cones!Feel free to bring a picnic blanket or lawn chair! Can't make it but still want to help The Common Park get going by giving funds for tables, chairs, and trees? Click here to Schedule your Give for Good donation now! The Ogilvie-Wiener house, also known as The Florentine, stands on historic Austen Place near the Shreveport Municipal Auditorium. Come take a tour and experience a Victorian Christmas at The Ogilvie-Wiener Mansion. The home, also known as the Florentine, is one of the longest standing historic homes in downtown Shreveport, and nestled in the heart of Shreveport Common! Located at 728 Austen Place, this historic building has lived many lives. The home, built in 1896, is the largest Queen Ann style historic mansion in North Louisiana. It was home to brothers and architects, William B. and Samuel G. Weiner, who designed the Shreveport Municipal Auditorium, one block away from the mansion. In the 1950's it was known as the Florentine Club, where national top entertainers and famous guests like John Wayne, Bette Davis, Doris Day, William Holden, and Ethel Merman visited and performed. In 1972, when it experienced a reawakening, it became a meeting place for night owls of all stripes, and the epicenter for underground culture and dance music in downtown Shreveport. It closed in 1996 after previous owner Gene Barnett’s death, and began a series of ownerships until 2011, when it was purchased by John and Debbie Bryant of Shreveport. The tour includes the history of the home, 10 beautifully decorated Christmas trees, Victorian Christmas décor, and light refreshments. dbdoll34@yahoo.com or call (318) 393-0668. 'Tis The Season To Be Giving: Our Shreveport Common Community Neighbors need your help for the Holidays! Mercy Center is creating an “Angel Tree” and recruiting community members to sponsor a resident. They have a total of 15 residents that have each gathered a list of some of the items they would like for Christmas. It's up to the sponsor to pick an item/s from the list to purchase. If you wish to sponsor a resident from the Angel Tree please contact the Mercy Center Director, Latoya White, at (318) 222-6633 ext. 2210. You will be given a number which will represent the "angel" that you will sponsoring and a list of some of the items on their list! Click here for more information about Mercy Center. Dishes, cooking ware, toasters, coffee pots, etc. Any of these items would go a long way in helping to create normalcy for families and to help them have the best holiday possible! Another option is to "adopt" a family and provide gifts for the entire family. For more information on any of these options with the Providence House, please contact Rhonda Watts at (318) 221-7887 or rhondaw@theprovidencehouse.com or click here for more information about Providence House. Volunteers of America of North Louisiana is continuing their 28 year tradition, Caring Gifts! Continue the tradition — or start a new one by sending Caring Gifts this year! This is an opportunity to honor your friends and family by making a Christmas donation, in their name, to Volunteers of America. In return, VOA will send them a beautiful, hand-wrapped angel to let them know how the donation you made in their name will benefit those the VOA serves throughout the year! If you are interested, here is the form! Volunteers of America North Louisiana also invites you to sponsor one of their neediest families, providing Christmas gifts for the children. Contact Haylee Crawford at Haylee.Crawford@voanorthla.org or (318) 716-7336 to become a sponsor, or click here for more information about the families they serve. With your generosity, you can provide hope for the holidays! Please consider one, two, or all of these options from our Community Neighbors this holiday season. View the Caddo Common Park Design. WE DID IT! Shreveport Common voted Best Community Development project in the nation, by peer vote. Big thank you to all our partners, starting with 1,100 Northwest Louisiana artists. City of Shreveport, Caddo Parish, SPAR, Community Development, Shreveport Regional Arts Council, Shreveport DDA, Northwest Louisiana Council of Governments, SporTran, and our neighbor Social Service Organizations, property owners, businesses, and of course, residents. Terrific recognition for our whole community. The National Development Council (NDC) awards recognize the top economic and community development projects in the nation and are part of NDC Academy 2015. The NDC Academy is a biennial conference focused on providing community development professionals from around the nation with the latest on policy changes and best practices affecting federal, state and local development finance tools that are critical to the achievement of urban and rural job creation, affordable housing and community development goals. The Shreveport Common team will travel to Washington, D.C. May 12 - 14, 2015 and compete with the 5 other semi-finalists to advance to the final round - and ultimately, to bring home the coveted award. Lt. Governor Jay Dardenne presented the Shreveport Common Team with the award for most outstanding Cultural District in the State, at the Capitol Park Museum in Baton Rouge this week. Shreveport Common sits within the designated Shreveport Downtown Cultural District as a unique, 9-block cultural community. The niche neighborhood is home to the UNSCENE! arts happenings such as last Saturday’s Big SCENE!, the Municipal Auditorium, and Central ARTSTATION, among other historic and burgeoning cultural icons. Shreveport Common is a nine-block urban neighborhood in downtown Shreveport that has undergone an arts-driven transformation through creative placemaking. This innovative Louisiana Cultural District has completely revitalized the blighted, sparsely populated area of downtown Shreveport with its Shreveport Common Vision Plan. In doing so, Shreveport Common has become a model for how to take a place and make it better with creativity. Its heralded work has garnered much recognition, from organizations as diverse as MIT’s Department of Urban Studies and Planning and Americans for the Arts, highlighting its status as a leader in Louisiana culture. Following the award ceremony, Shreveport Regional Arts Council Executive Director Pam Atchison was invited to present to an audience of Cultural Workers from across the state on a Creative Placemaking Panel. Ms Atchison was joined on the panel by Jessica Kemp, Vice President of Policy and Advocacy, Center for Planning Excellence, and the nation’s leading “guru” on Creative Placemaking, Ann Markusen, Director of the Arts Economy Initiative and the Project on Regional and Industrial Economics at the University of Minnesota’s Humphrey School of Public Affairs. Eric Melancon of TMG Consulting, Wendy Benscoter Shreveport Common Project Manager, Pam Atchison Exec Dir of SRAC, Liz Swaine Exec Dir of DDA, Shreveport Common Lead Designer Gregory Free, and Suzanne Leckert of TMG Consulting. Shreveport Common partners Downtown Shreveport Development Corporation (DSDC), Shreveport Regional Arts Council (SRAC) along with TMG Consulting have been given statewide recognition for work done on a Market Analysis of the Shreveport Common art and culture district in downtown Shreveport. The team has won the American Planning Association-Louisiana Process Award for the 2014 Market Analysis showing the opportunities available in Shreveport Common. The Market Analysis was conducted over a 6-month period and involved input from property owners, developers, bankers, Realtors, artists, elected officials and many others involved in the ongoing development of the arts-centered neighborhood. The Market Analysis showed that there was – and continues to be - a demand for residential and retail development in the 9-block area and that development, done right, can be profitable. “The recognition from APA- Louisiana is further evidence of the success of the grass roots — door to door–collaborative, comprehensive planning process for Shreveport Common; one that engages Creative Placemaking techniques and initiatives… putting artists and the arts community at the helm of planning and design,” says SRAC Executive Director Pam Atchison. The Market Analysis was funded by DSDC, SRAC, Community Foundation, Downtown Development Authority, City of Shreveport, Parish of Caddo and JP Morgan Chase Foundation. As part of the APA recognition, DSDC executive director Liz Swaine, SRAC executive director Pam Atchison and TMG Associate Eric Melancon were asked to present their methods and findings to planners statewide at the American Planning Association- Louisiana Conference in Baton Rouge. Conference attendees from around the state were able to hear about the Shreveport Common Vision Plan, the findings of the Market Analysis and recent investment in Shreveport Common. You can now keep up to date in print with the happenings of Shreveport Common every other week in the underground community paper Heliopolis! Helio - as the kids call it - is a full color print newspaper and website that targets young people interested in community, civic leadership and the Arts. It's written and read by people who love Shreveport-Bossier, just like we do at Shreveport Common. Check out past columns of Common Interests, written by Shreveport Common Administrator Esther Kennedy, online here. And look out for the print all around town, including at Central ARTSTATION. Downtown Development Authority's (DDA) Pop-Up Projects have been hugely successful and next week the latest edition is happening in Shreveport Common. Previous projects have had a mix of start-up businesses from fashion to technology, but this will be specifically themed "Foodie Fest". The Shreveport Common Vision Plan has long imagined a food truck court at this location - the NE corner of Common and Crockett - so this represents yet another realization of something that was merely an idea not three years earlier. Downtown workers and residents will have a plethora of lunch options during the week of November 3 - 7, including Mexican food, gourmet grilled cheese, curried meat pies and crawfish pirogues, to name a few. "This is like a forum in reverse. Instead of voters listening to candidates, it's the candidates listening to voters." That's how Charles Johnson, the 26-year-old president of the Young Democrats of Shreveport, described SBC Unfiltered, a public event Thursday night at downtown's Central ARTSTATION designed to invigorate Millennials ahead of the Nov. 4 election. This weekend we are very excited to welcome back 24 neighbors as they settle in to their newly renovated homes at the Mercy Center. Read about their extensive renovations here. In the creation of a community cultural district, the overriding goal is to produce an environment in which all forms of artistic expression and the artists themselves can live and flourish. The Shreveport Common cultural district requires visioning at both ends of the spectrum. This is an existing neighborhood with significant landmarks, not empty acreage along a freeway. There are important cultural, religious, and social institutions, landmarks of another sort at every turn. Now some of those are being restored and given new life, significantly—the Municipal Auditorium – and soon the Central Fire Station, which will introduce the dynamic Shreveport Regional Arts Council into the neighborhood. The goal of this Vision Plan is a custom cultural district, with its own special Shreveport scale, and flavor, a place for emerging arts and artists. Leeann Stawasz – A group sculpture of the organic subject of a tree, created from metal. It will be placed in a highly visible location that will ‘grow’ leaves over a period of a few weeks, in contrast to the natural trees that will be dropping their leaves. Through the’ growth’ of the piece I hope that people will reflect on the growth of our city and with the progression of adding leaves, reflect on the appeal of many joining together in unity. JRyan Artist – A “Greetings from Shreveport Common” 25’x15’ vinyl banner that will be portable and have the ability to be displayed at various events throughout Shreveport Common. Jeff Morgan – A translucent curtain made of recycled plastic and glass bottles that are to be suspended from rafters and illuminated by solar spotlights. More opportunities just around the corner! Joe O’Connell and Blessing Hancock, project designers from Tucson, Arizona, share that “Line and Sky is a stage for creative expression in the Shreveport Common. This highly interactive sculpture supports physical exploration, fitness and play at this contemporary transportation station. We were inspired by CommonLink’s mission to tie together arts and transportation in an original way. Line and Sky asks the Shreveport community to use their imagination. What if you could construct your whole world out of a continuous line? What would this ‘tied together’ world look like? What would life feel like if art and functionality connected seamlessly along a single axis? We are inviting the community of Shreveport to join us in this creative challenge. As a monument to the neighborhood this piece will represent the life and breath of Shreveport residents. Line and Sky is a three-dimensional ‘sketch’ that moves across the site at a human scale. Nearly 2000 feet of two-inch pipe arranged in a single twisting line makes up a complex visual drawing. Visitors wind their way through the drawing and encounter ever changing perspectives and opportunities for interaction. The energetic line is carefully framed by a ‘floating’ mass of light and color. This simple horizontal canopy offers shelter and a restful counterpoint to the dynamic linear element. The three-foot-thick steel truss canopy gently curves over the site, wrapping at the ends and breaking into cubes along the groundplane. These cubes arranged on the ground plane suggest a three dimensional map of transit routes and city blocks through which the line moves. Line and Sky is a striking landscape of contour and mass. Emphasis is placed on physical movement as a form of transportation. Our concept offers a flexible and open-ended environment that spurs creative interpretation and usage. The physical and social dynamic of residents using the shelter will clearly be reflected in Line and Sky. Our aim is to join with the community to create friendly connections and group interaction through the sculpture. This is a place to show off, work together, swing, dance, climb, balance, jump, hang, reach, try and learn by doing. These multiple interpretations and uses invite community expression, sharing and trust. We’ve created a colorful porch open to the community. In fact we have included a porch swing! Canopy: 225’ x 27’ x 15’ steel truss structure clad in 8mm twin wall polycarbonate and 3/4’ acrylic panels. Lit with outdoor florecent lighting. Color optional. Line Drawing: 2000 feet of 2” and 6”schedule 40 steel pipe painted red. Electronic Hub/Interactive: Multiple touchscreen stations provide real time updated transit map data and internet access. Additional touch sensitive interactive components will control the canopy lighting.